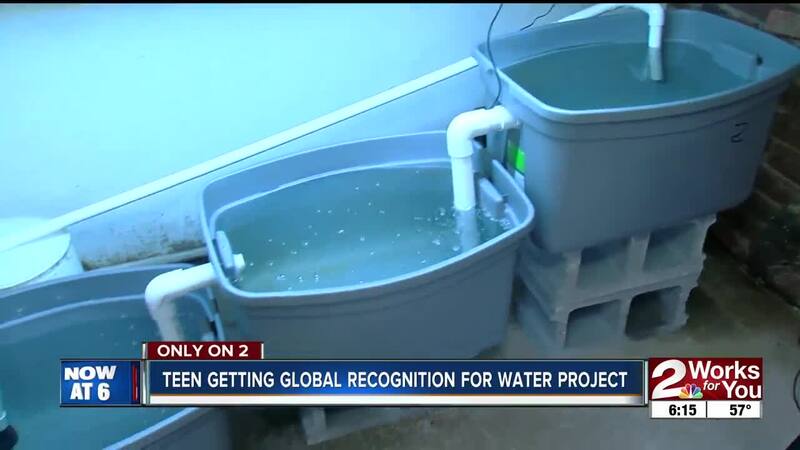 TULSA -- A Tulsa teen making major strides in cleaning our rivers and streams is now getting global recognition for his advancements in environmental engineering. "Seeing what will make an impact on the world really drives me forward," said Braden Milford, senior at Cascia Hall. Braden created a water purification system right in his Cascia Hall classroom. "My project associates environmentally extracted bacteria with algae in a jelly-like system that you can then deploy into a stream and it will intake water toxins," said Milford. Braden built a simulated stream system from scratch to show how his project would work out in the environment. "I need to show that it can function in moving water and also large volumes of water so it’s actually applicable to a real stream," said Milford. Because of the success in the project, Braden was one of 33 teens from around the world to be named a 2019 Three Dot Dash Global Teen Leader . "I love what I do, but to have this organization believe in what I’m doing and see the impact that I can make and give me the tools to further that impact is really incredible," said Milford. He's traveling to New York in March where he'll be paired up with a distinguished mentor in the science field to help project and vision grow. "Past people are like the Vice President of NBC Universal, Bill Gates’s personal adviser, Oprah Winfrey’s personal assistant," said Milford. Braden is also in the running to compete in one of the top science competitions in the nation, called Regeneron Science Talent Search. He was one of 300 students chosen from 2,000 applicants. If he makes top 40 he'll take in $25,000 which he says will help develop his water purification system. The overall winner gets $250,000. "It was just kind of incredible to see what I’ve been doing in this classroom for four years represented against so many other extremely talented people around the nation," said Milford.